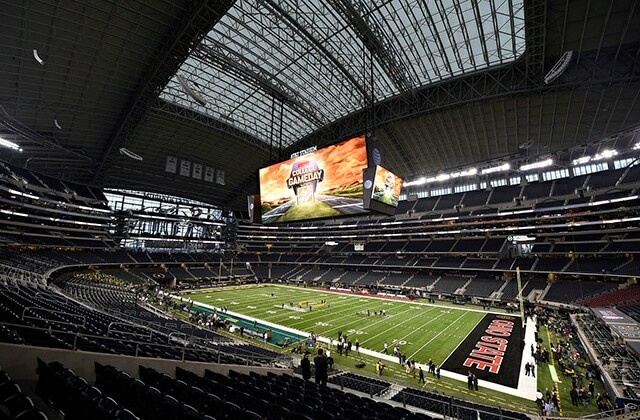 AT&T Stadium, home to the Dallas Cowboys, seats 80,000, making it the fourth largest stadium in the NFL. 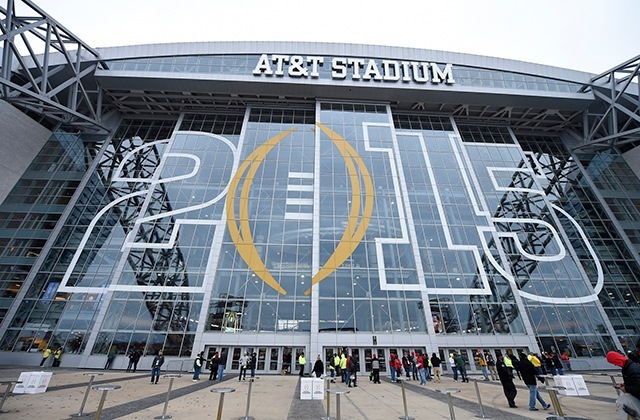 The maximum capacity, including standing room-only, is 105,121. 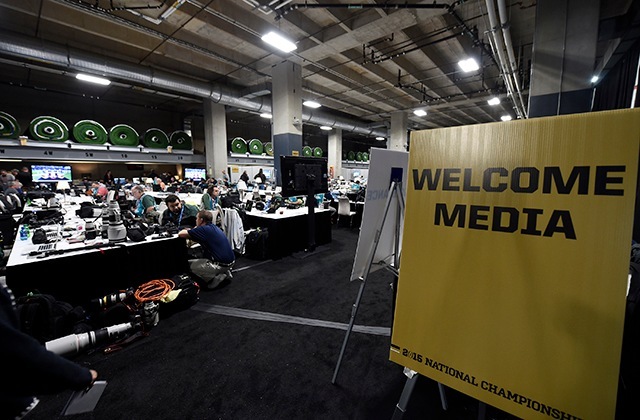 A beehive of pregame activity, the Media Center will be relatively quite during the game -- except the undeniable pecking of keyboards while tweeting random observations -- and again will be buzzing postgame as photographers and writers scramble to make their deadlines. 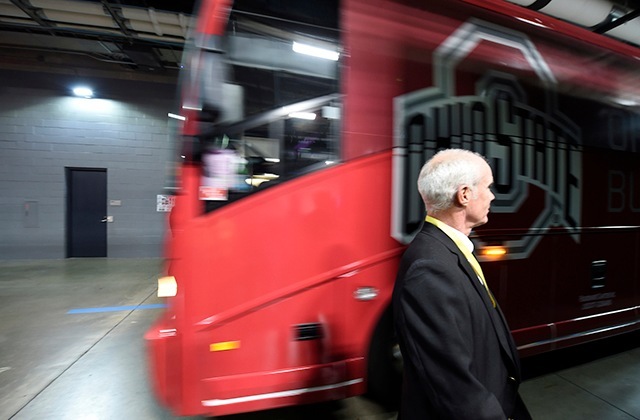 The fourth-seeded Ohio State Buckeyes have arrived. 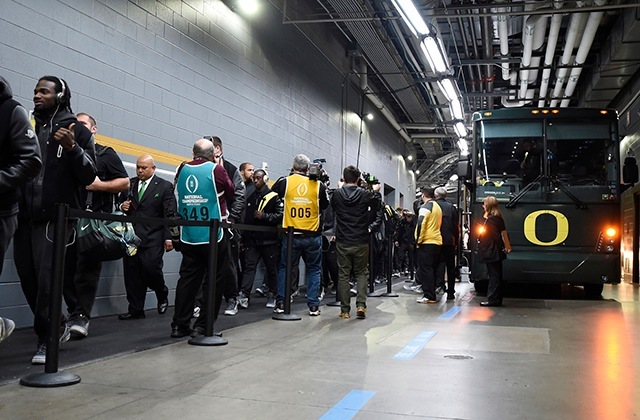 Oregon players file off the bus into the locker room. 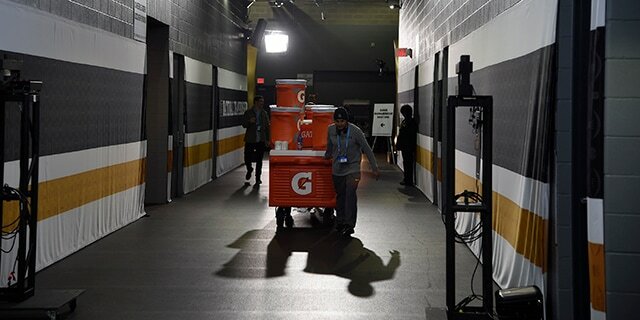 Stadium workers prepare for kickoff, wheeling carts of Gatorade to the sidelines. 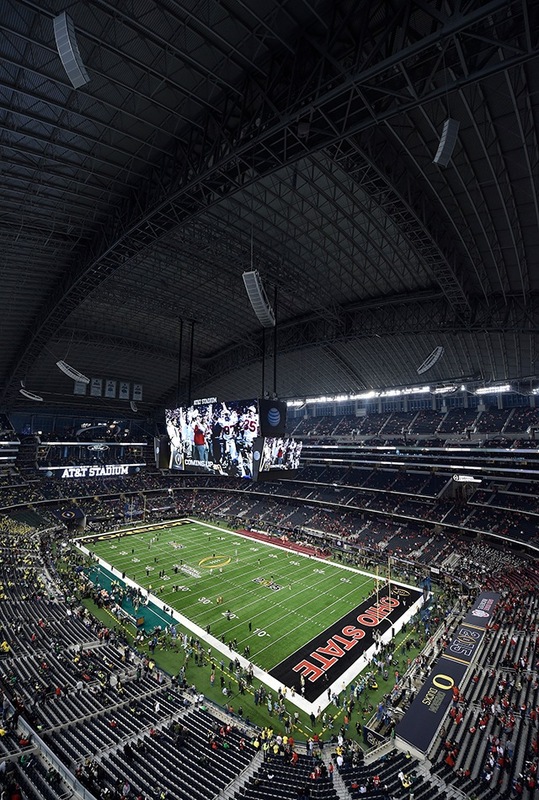 Yes, AT&T Stadium boasts of the world's largest column-free interior and the fourth largest high definition video screen, which hangs from 20-yard line to 20-yard line -- 60 yards total. Doesn't seem to be a bad seat in the house -- and the view is ... wow. 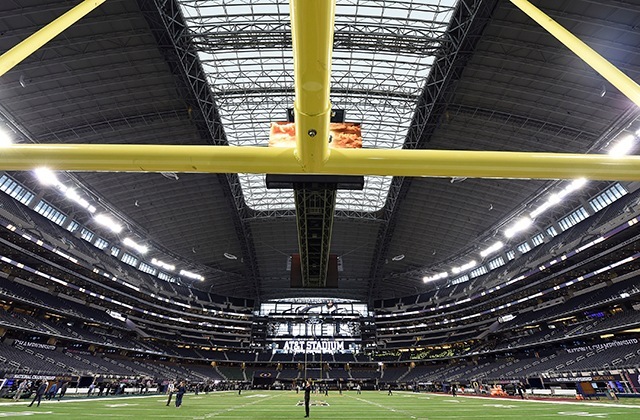 Looking out from under the goal post, you can imagine a game-winning kick making its way toward you. 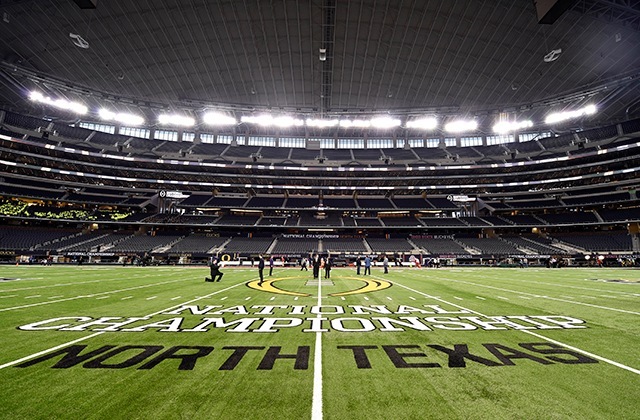 The FBS title will be decided here. ... And no doubt you can find those people sharing images on social media. 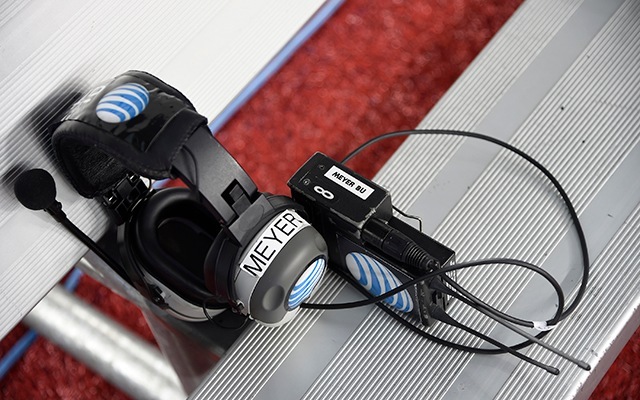 Wonder if that's the same headset Urban Meyer tossed in the Sugar Bowl? ... as does Ohio State. Ezekiel Elliott (15) proved to be elusive in the first half, rushing for 98 yards, including a 33-yard TD scamper. While Ohio State's Devin Smith (9) waited with open arms, Oregon's Troy Hill was flagged for pass interference in the end zone. 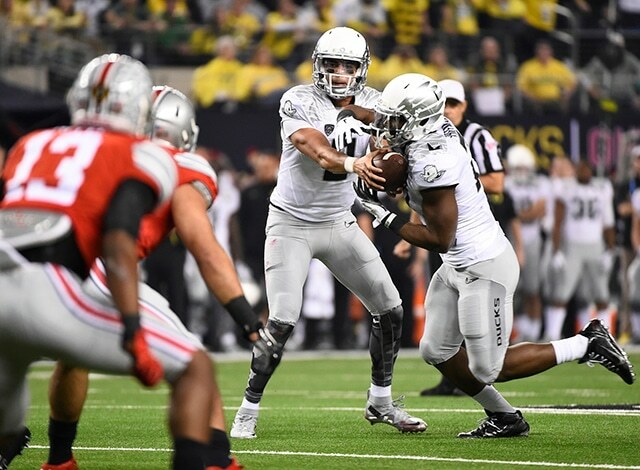 Heisman Trophy QB Marcus Mariota (8) read the Ohio State defense before handing off -- or did he pull it back to throw downfield? Devin Smith, again waiting with open arms, was blanketed in the first half; he had one catch for 45 yards. 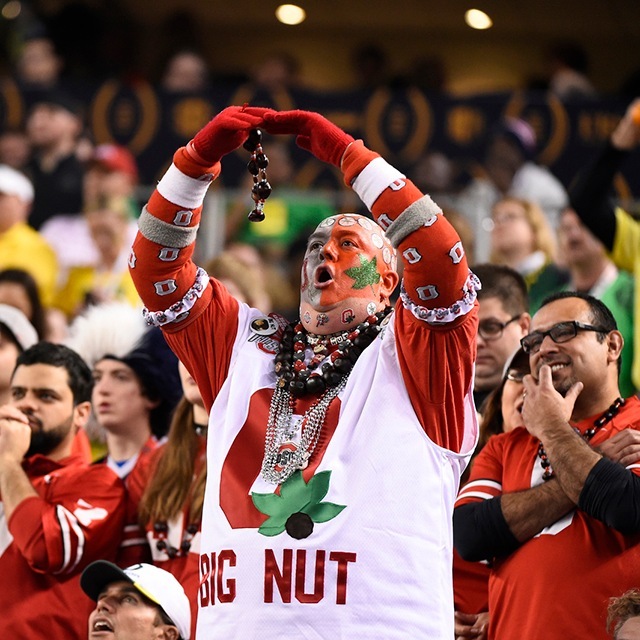 A lot of love for the Buckeyes -- and an 11-point halftime lead. 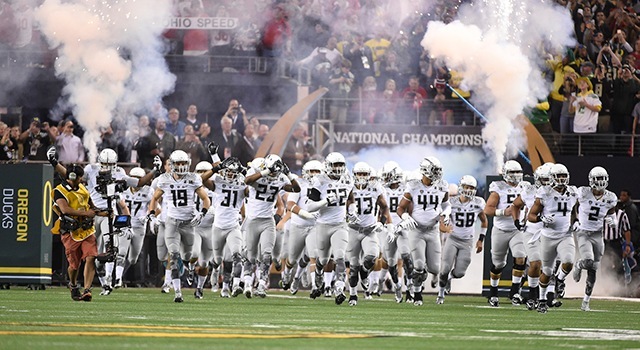 Ohio State opened the second half with the ball and marched into Oregon territory before an interception breathed life into the Oregon faithful. However, Ezekiel Elliott (15) scored three of his four touchdowns in the second half to seal the Buckeyes' convincing 42-20 victory. 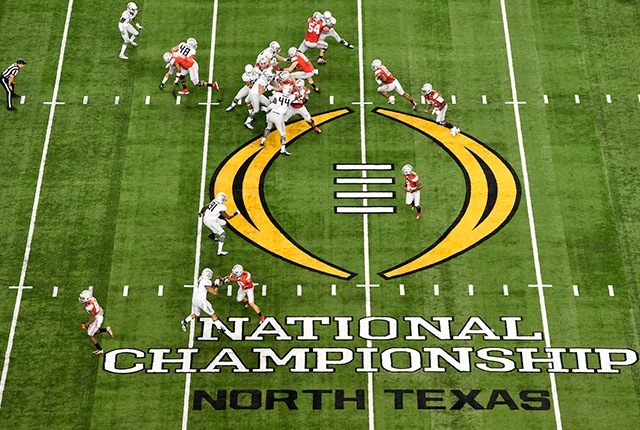 Ohio State tacked on its final score with 28 seconds remaining to give Urban Meyer his third national title and first with the Buckeyes. Senior CB Doran Grant with a stadium edition of The Columbus Dispatch celebrating Ohio State's title. 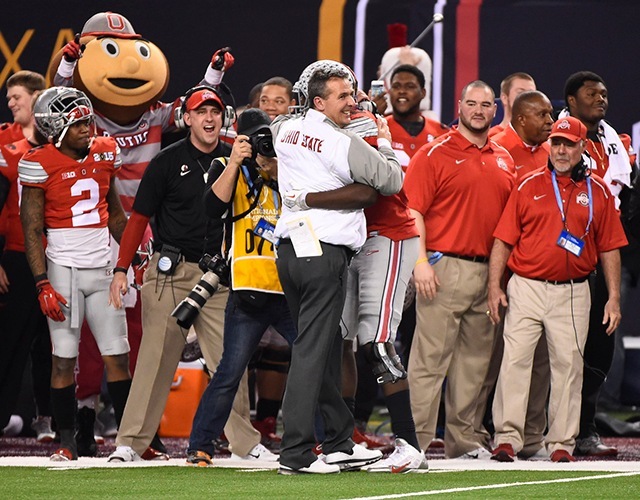 Ohio State head coach Urban Meyer and game Offensive MVP Ezekiel Elliott with the spoils of victory.